Another continental move for my family and I; another absence from the blog. The tower of books is once more boxed and in a shipping container and I can’t seem to find my kindle charger anywhere. But, as we bounce around here and there, I still manage to stumble upon books I’ve been wanting to read. 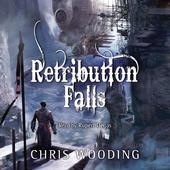 Case in point is the current self-catering house my wife found with a fairly decent stock of novels, including Chris Wooding’s rambunctious and rollicking Redemption Falls. I came to it with expectations, having heard it compared with the TV series Firefly numerous times. There’s vague similarities but Wooding’s novel stands on it’s own in my opinion. The blend of Wild West/pirates/futuristic/other world ingredients he has created is brilliant and sprinkled with so many details it’s truly captivating. The pace of the novel never let’s up whilst the dialogue and dynamics between the cast is a mark of the author’s craft. The action centres around Darian Frey and his crew of misfits aboard the Ketty Jay, an airborne ship of mechanical merit but little aesthetic beauty. An unsuccessful smuggler and an even less successful pirate, Frey can’t believe his luck when he is offered a job to good to be true. And was he right; the job is a set up that starts in motion a gripping, page turning tale. Frey, along with his crew, are made scape-goats in a plot of epic proportions and to clear their names they must face all manner of ill. From merciless bounty hunters to stone cold soldiers of the realm, they are wanted by everyone to answer for their supposed crimes. What is great is the subtle changes in all the characters as they continue on their journey, each one facing up to their past and finding their true place as crew members of the Ketty Jay. Wooding has produced a wonderful start to a series of novels, peopled with a fantastic bunch of actors, each expertly created. The action, the dialogue and the story really entertained me and I’ve already spied the next novel, The Black Lung Captain waiting for me. Happy days!